When Dallas Henry and his sons, Lucas and Denver, load hay with their schoolbus bale loader, people driving by often stop to take photos. "Truckers love the bus and call it the fastest bale loader in the state," Henry says. "We generally run across the alfalfa field at 15 to 20 mph. The bus is real stable at 9 ft. wide." The Faulk County, S. Dak. farmer has been featured in FARM SHOW in the past with a 90-ft. floatation sprayer and 5th wheel side dump semi grain trailer he built. He purchased the modified bus several years ago. It already had the forward gears reversed so that an operator drove and loaded hay facing the back. "When I was a kid we had a reversed Farmall M, and I loved the principle of the load on the straight front axle and rear steer," he notes. 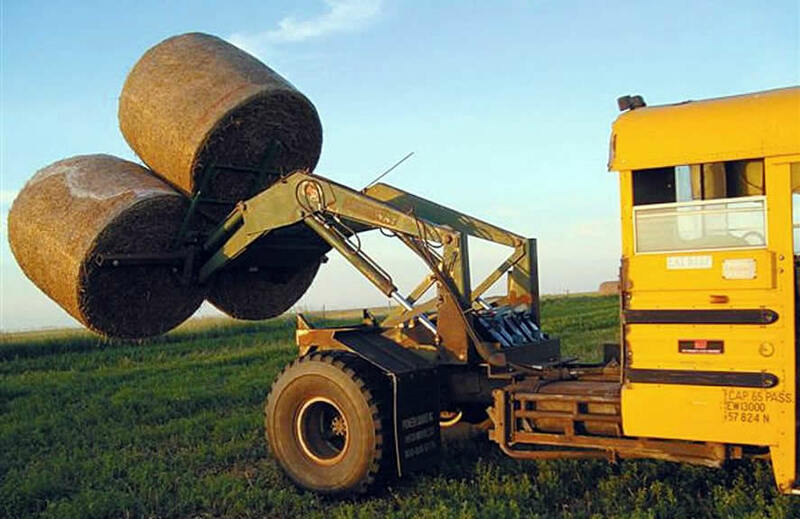 Henry made several more modifications to make the bus more efficient, loading as many as 1,000 tons of big round bales each year that he sells to dairy farms. "I added a 2/1 ratio auxiliary transmission to the 4-speed Allison auto to gear it down, and I added an oil cooler just for the Allison." he explains. "I added a 22 gpm hydraulic pump. I bought an Art's Way loader built in the early 70's; it came off an 850 Versatile tractor. I added the MDS Sur-Lock quick-attach to it and use a modified MDS bale spear with three spears per bale." He loads up to 3 bales at a time, and with the larger tires he mounted on the bus, he can travel quickly across the field, and over badger holes, to get to the next bales to load. He travels up to 40 mph on the road. With an automatic transmission it is easy to drive, and the long distance between the operator's seat and the end of the loader eliminates bending and straining to see the bale when loading it high on a truck. "I like the speed and smooth ride. And my tractors are freed up for haying. The bus is dedicated for loading work," Henry says. As a bonus, with a second seat there's room to give kids a unique bus-riding experience. CLICK HERE to quickly & securely Subscribe for 12-months of FARM SHOW Magazine!